Even though my new "Beauty Room" is far from finished (we are still working on the bed, end table, decor, and basic organization), I have still been using my new room; especially the vanity. I have put my make up on several times in the day while sitting at the vanity, and the light is fabulous. In fact, on a very sunny day I actually had to close the sheer drapes because it was too bright! But once I moved the sheer to cover the window, the lighting was perfect. I did have to put my make up on once in the dark. I was wondering how that would work, and it ended up being fine. The room is very well light, and I checked my make up in the bathroom mirror before I left. 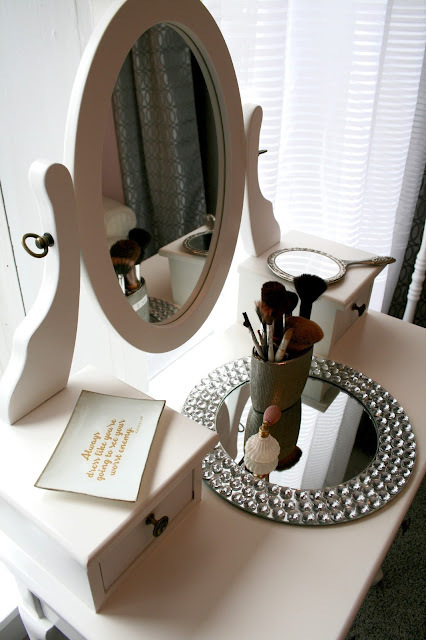 I really do enjoy sitting down at this beautiful vanity to apply my make up. It seems a lot less stressful, and is actually kind of fun and relaxing. I was worried that because the vanity was so small, I wouldn't have room for everything. But I was wrong: I did! Here is how I store all my cosmetics. On the top of my vanity I keep my make up brushes. I found this pretty toothbrush holder at a home improvement store. It was just the right size and style to hold my brushes. I placed a hand mirror on the right top of the vanity and this pretty little dish on the left side. It's just perfect for throwing little items in: like bobby pins, rings, small earrings, etc. The perfume bottle is old. I am keeping my eye out for more of them, but I don't want the top of the vanity to get too cluttered. I found I like to set my make up on top of the mirror while applying it. If I set it directly on the vanity, I get a make up stain that's more difficult to get off the wood than the mirror. Both the mirror and the pretty dish were found at T.J. Maxx. Don't you love that place? I've been going there once a week since I started this redecoration project. They get new items in every week and I'm never sure what I will find next! Now for how I store my cosmetics. The vanity has five drawers, and although I filled them all, none are filled to capacity. So I have room to grow! The top left drawer I have my tools, moisturizer, and concealer. In the top right hand drawer, I put items I'm either currently not using or rarely use. The first bottom drawer on the right holds all my lipsticks (I have more, but those are in my purse! ), loose facial powder, mascara, and my eyelash curler. The center drawer, the drawer hardest for me to reach because my body is in the way, holds all my foundations I'm currently not using. I change my foundation with the seasons, because the color of my face changes depending on how much sun I get. And finally, the far right drawer...the drawer closest to my dominant right hand, holds the items I use the most. My favorite eye make up ("Naked" by Urban Decay. Someday I will do a post on this awesome eye shadow palette), my current foundation, bronzer, and illuminator. Now some of you are probably wondering "Don't I need a sink?". I do. The normal order of my routine is to wash my face, brush my teeth, and then put my contacts in. After that is finished, I then move to the vanity to put on my make up. Then I usually move back into the bathroom to wash my hands and style my hair. I haven't tried curling my hair at the vanity yet. There is no outlet on the wall the vanity is placed near (one of the drawbacks of living in a century old house). But I think if I ever curl my hair in a way that takes a lot of time, I will probably just run an extension cord across the room because it is so nice to sit down! Now that all my cosmetics are in my vanity, my husband is thrilled to have his counter space back in the bathroom. So ladies, if you want a vanity, this is a good incentive to tell your hubby so he will buy you one! On a side note, I just found out my Easter Outfit was chosen twice this week on two different link ups! 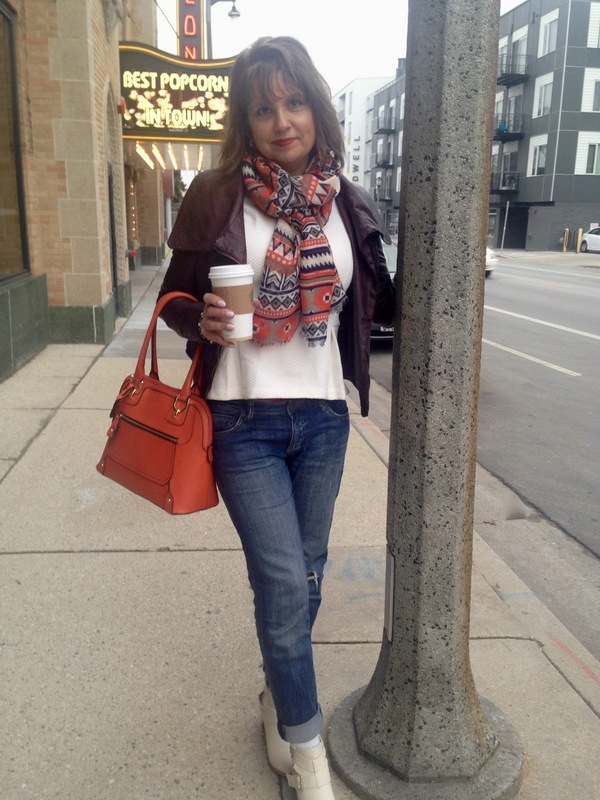 I was featured in "The Spotlight of the Week" on Stylin in St. Louis and Living in Color Style and in "Thursday Moda" on Elegance and Mommyhood! How exciting is that? Every Wednesday I share a travel post. The past month I have been sharing all my latest Florida adventures, but I thought I would skip that this week and talk about what my husband and I did for Easter instead. With the kids in Florida for Easter, hubby and I were alone for the holiday. Instead of getting all mopey if we are alone on holidays, we always like to make the best of it by getting out and doing something fun. I think that is the real key to enjoying your twilight years: getting out and doing things together. Don't stay home in that recliner pining for the years when all your babies were younger. Every season has it's blessings and it's trials. The blessing of the golden years is NO KIDS! You can go and do whatever you want! 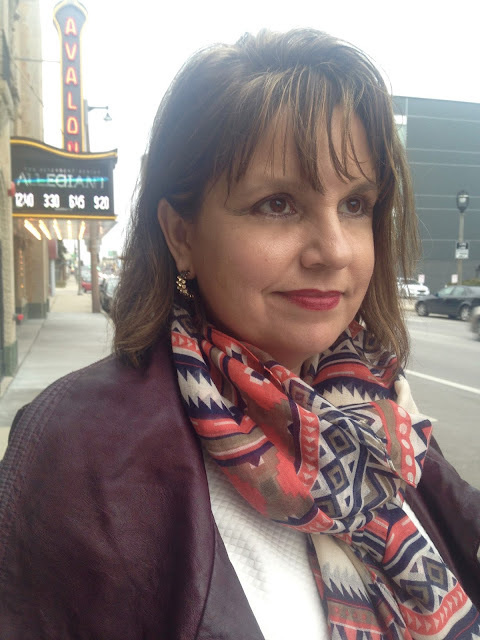 We decided to go to our hometown of Milwaukee, Wisconsin to see our old church's Easter musical, visit with friends, get a nice hotel room, and attend the Easter Sunday service. My husband and I met over thirty years ago at a church in the Milwaukee area. We we were married in this church, and dedicated our children in this church. I will always have a special fondness for this church in my heart. My biggest regret of leaving Milwaukee was leaving this church. I've been to countless churches since, and I have never been truly happy at any of them the way I was at this church. My husband would probably say the same. Every Sunday we just wish we could beam ourselves there and be in one of the services. But sadly, we live over four hours away now, and that's impossible. My husband grew up in this church when it probably contained all of about fifty people. Since then, it has grown to over 4000 and is the largest Assembly of God church in Wisconsin. This church, knows how to do it right. It has managed to change with the times (providing contemporary music, dance, and children/youth ministries), yet still maintain foundational, biblical truths. The facility of this church is amazing. Of course, one of my favorite amenities is the Starbucks located right inside the door. They also have a cafe that is open before and after services. This is just one wing or entrance to the church. 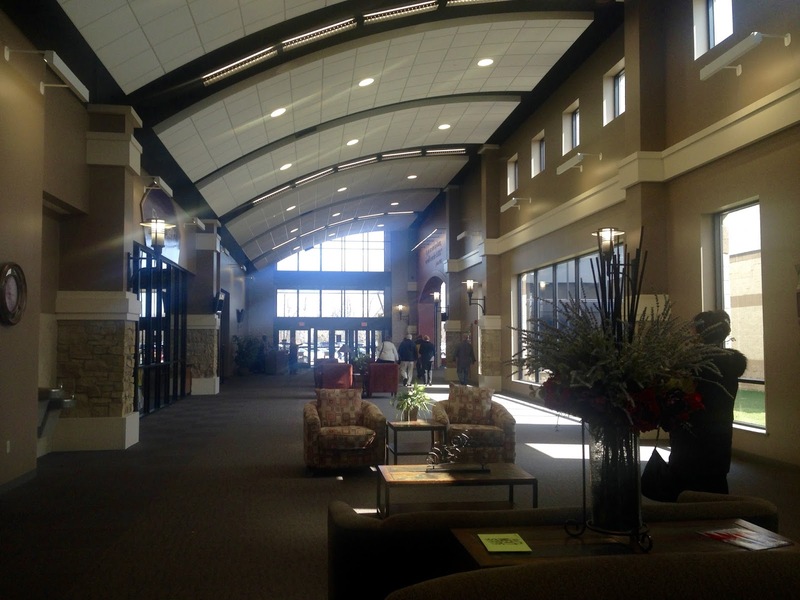 It is where the bookstore, cafe, Starbucks, and children's ministries are all located. The first thing I always notice about this church is how friendly it is. The staff works really hard at making sure everyone is greeted and appreciated, no matter how big the church gets. There are greeters at every entrance (and there are a ton of entrances) and at the doors to the sanctuary. Plus, the staff walks around in the foyers and wings greeting and talking to everyone before, between, and after each service. But the friendliest isn't just because of the workings of the staff, even the congregation itself is so friendly. So many people seemed genuinely polite and interested in talking to us and each other. It's a rare thing I see in most churches today...especially in the area I live. This is their beautiful sanctuary. We were there to see their Easter musical, which was wonderful. My husband and I use to be in all their musicals and I still miss not being a part of them. Flash photography wasn't allowed at the musical, so I didn't take any pictures. If you'd like to see pictures of the musical, check out Oak Creek's Facebook Page HERE. After the musical was over, we chatted with people we knew from when we attended there and met lots of new members as well. Then Todd and I went to one of our favorite restaurants in Milwaukee...Gyro Palace...with one of his best friends from childhood Kirk (pictured on the left in the picture below, and Shannon's hubby) and his son Brandon. Shannon and their daughter Tori couldn't join us, because they had another show to perform. This picture was actually taken the following morning after the Easter Sunday Service. And yes, I wore my new Easter outfit that I showed you in THIS POST. It was only in the upper forties that day, but I wore a white coat and really only had to walk from the car to a building, so I wasn't uncomfortable. The church had the most gorgeous spring flower arrangements I had to show at least one to you. 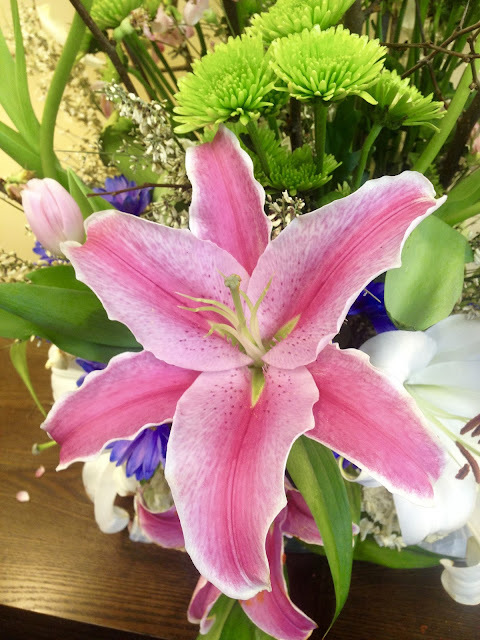 Isn't this Stargazer Lily just beautiful? And it smelled wonderful too. Shannon said a lady in the church makes all the fresh flower arrangements herself. What a wonderful ministry! 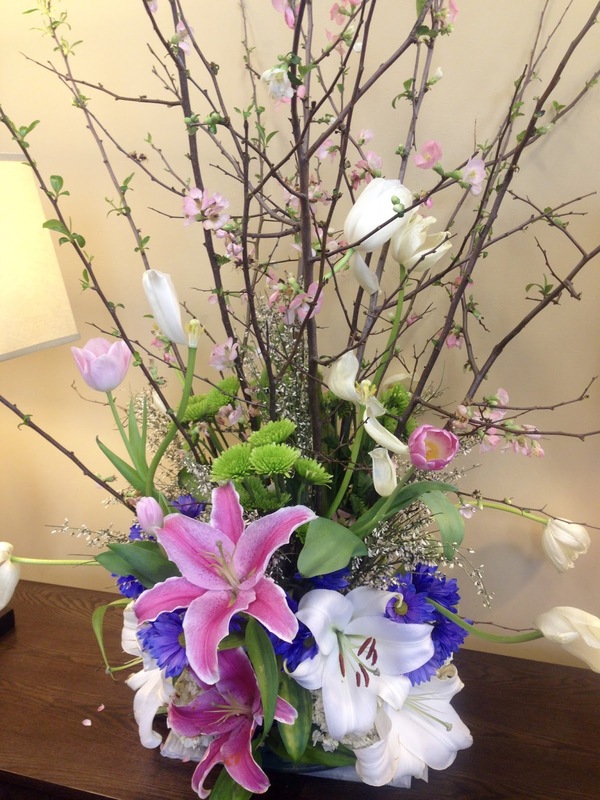 I love the use of spring branches mixed with spring bulbs and Easter lilies. In addition to attending the Easter musical and the Sunday morning Easter service, we also had the rare opportunity to catch a movie. We don't go to movies too often...probably only twice a year, because we live forty five minutes from the nearest town. When my hubby has to drive that distance every day, he doesn't want to drive it again on the weekends. 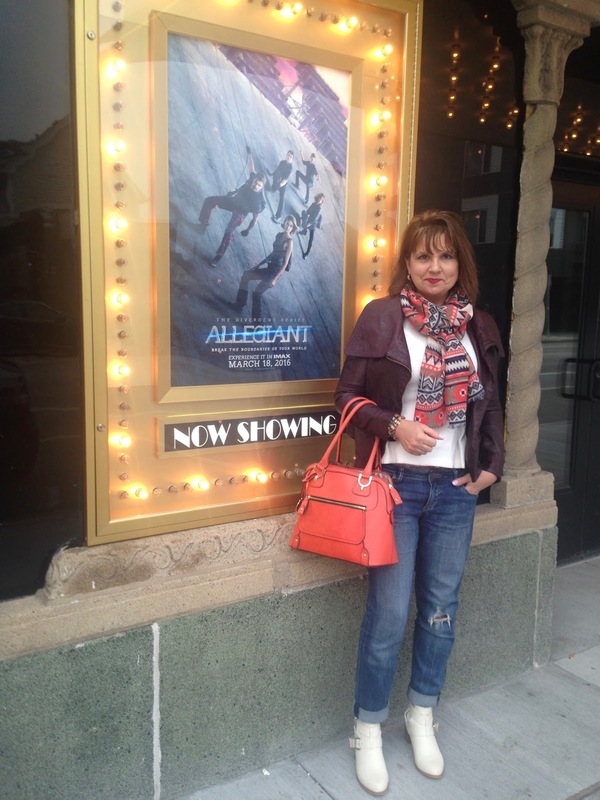 I love the "Divergent" movie series, so I was super excited to see the third movie "Allegiant". The plot is so interesting, plus I love anything with a strong female lead. Of course, I didn't think it was as good as the very first movie, but I liked it nevertheless. There were some really exciting, fun scenes in this movie. I especially liked the one where they scale the wall as shown in the marquee behind me. What made seeing this movie even more fun was seeing it in a historic theatre in my old neighborhood: Bay View. It's always so interesting to return to your childhood romping grounds and see how things have changed. Usually things change for the worst, but I was awestruck at all the improvements that were made in this neighborhood from when I use to live there. It went from a run down, poor neighborhood to a really hip, cool place. 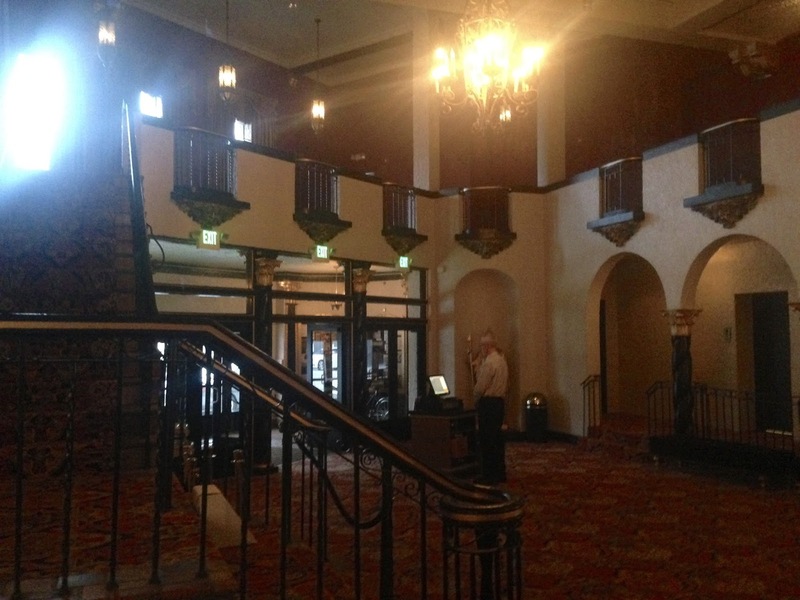 They remodeled the theatre in 2014 making it larger to include a restaurant/bar and multiple theaters, but the original charm of the old place was still there. These are pictures of the foyer. It was built in 1929 and is styled with a Spanish motif. Our movie was shown in the newest theatre and we had to walk this long, gorgeous hallway to get to it. 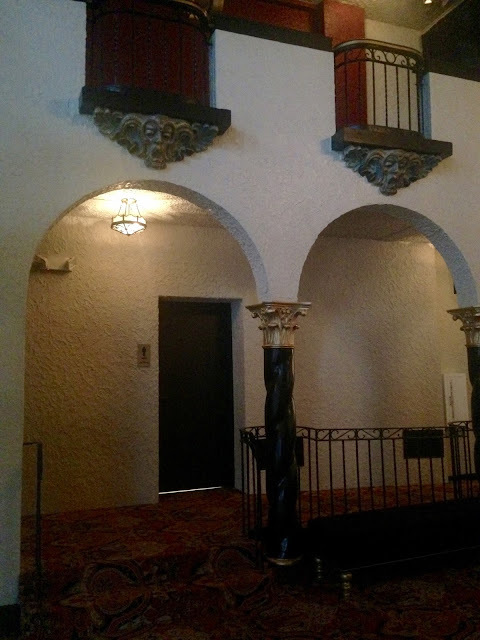 Sorry for the grainy pictures, but the lighting in this building was quite dim. The big surprise about this theatre was the amazing seats. They have huge, reclining, leather seats with tables! A waiter comes to your seat and offers a menu shortly before the movie starts. You can enjoy dinner and a movie at the same time! And here is the bathroom. 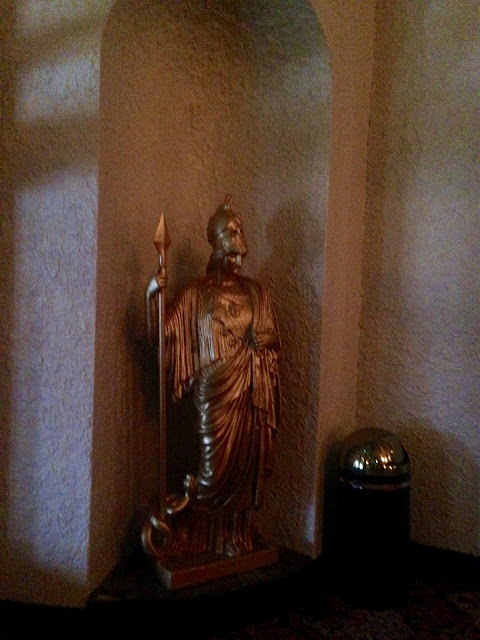 Is this lux or what? And here is the outside of the theatre with the historic sign lit up at night. And of course a trip to the big city would also involve some shopping too! We managed to stop at a few stores and I picked up a pillow for my "Beauty Room", a scarf, hat, jewelry and chocolate. My husband is always so good to me! And that was how we spent our Easter weekend! It was a quick, but fun trip; always over too soon! I hope you all had a great Easter weekend as well. I would love to hear how you spent your weekend in the comment section below. Soaring Away with "Adorable Elephants"
I made a scenic card using MFT's "Adorable Elephants" stamp set. Rather than coloring a sky, I just used a piece of designer paper from Prima "Annalee". 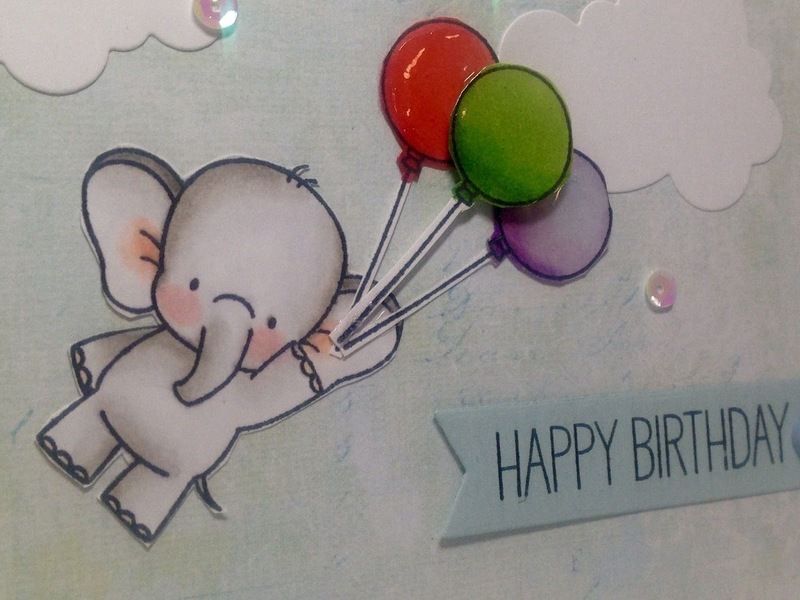 The elephant and balloons were stamped on card stock, colored, cut out, and adhered to the designer paper. I put Crystal Effects on the balloons to make them shiny. The center balloon is popped up on a dimensional. The clouds were cut with an MFT die. 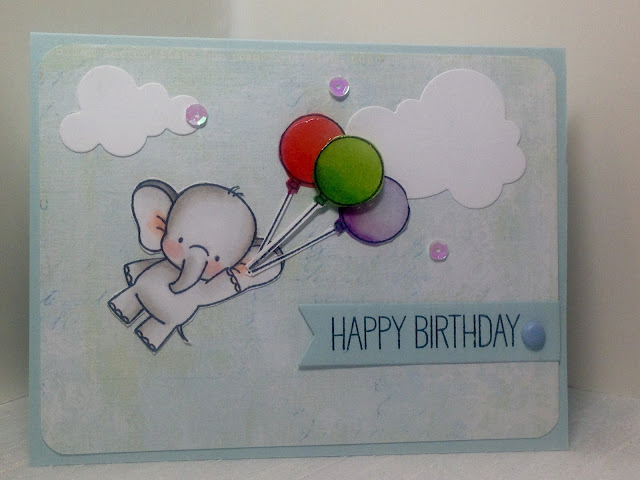 I stamped the sentiment onto blue card stock, cut it out with an MFT banner die, then adhered it to the card with a brad. I then scattered a few sequins around for embellishment. Hello! I'm back from a wonderful Easter weekend in Milwaukee, Wisconsin...my hometown. 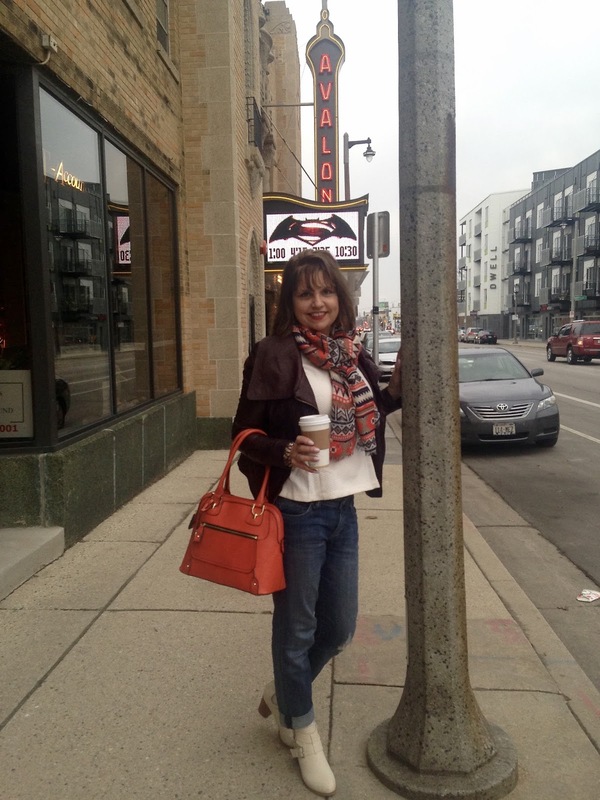 Today's fashion photos were taken in my old neighborhood...Bay View... in front of the historic Avalon Theatre. 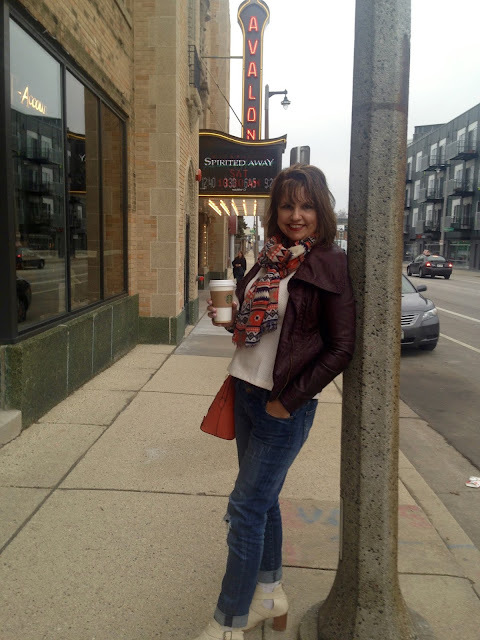 I'm going to share more about our fun weekend and this beautiful theatre in Wednesday's Travel post. You will also see more of this outfit then too! I decided to try and cycle through my jacket collection and wear each jacket at least once before the weather gets to warm. 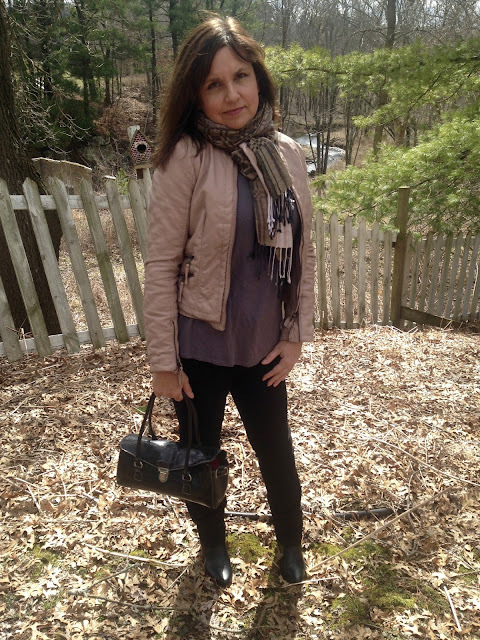 The one I have on in these pictures is my brown faux leather jacket by Guess that I picked up at T.J. Maxx a few seasons ago. The last time I showed it to you was in 2013 in THIS POST. It was in the upper forties/lower fifties when these pictures were taken. For us Wisconsinites...that's a warm winter/spring day. I know a lot of my southern blogging friends would be donning knit scarves, mittens, and parkas in that weather, but most of us here shed our coats when the temps hit those highs in spring! This is the time of year I actually use scarves the most...not winter. I don't feel I need a scarf too often in winter because my coat zips right up to my face and I usually have a bulky sweater on. 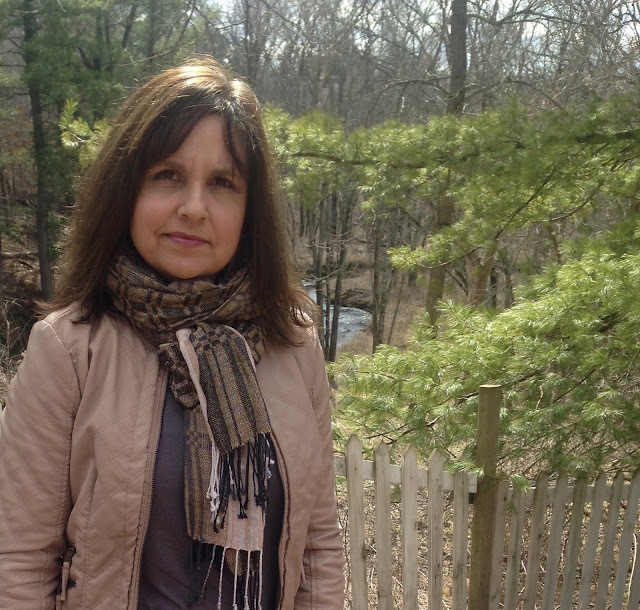 But in the spring or fall when the temperatures fluctuate so much, I depend on scarves for that extra layer of warmth and also because I can put them on and take them off so easily. My scarf has a tribal print on it and was purchased at Forever 21 several years ago. It's one of my favorite scarves and gets a lot of use! 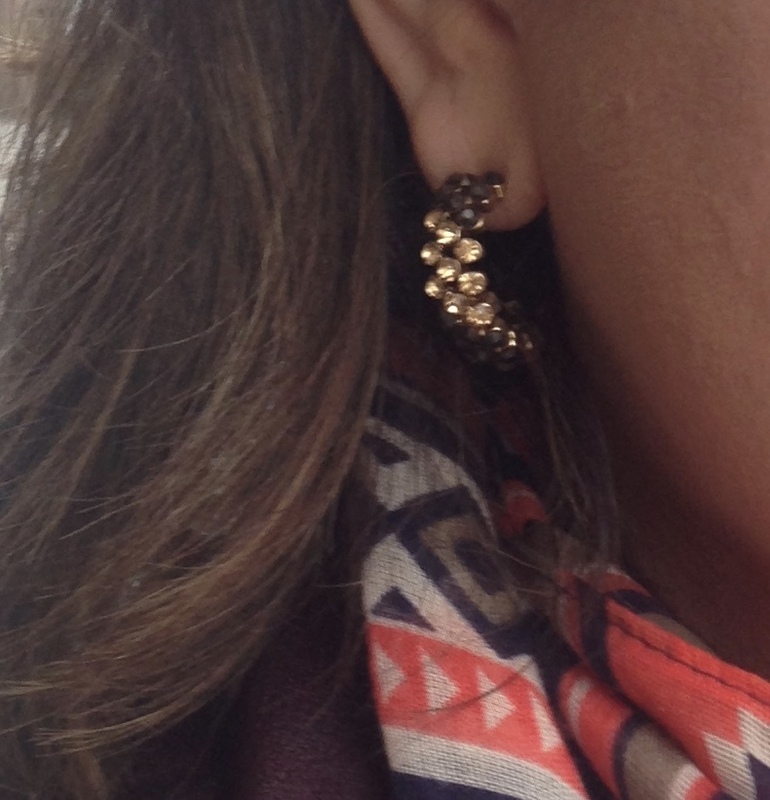 I wore brown/gold half hoop crystal earrings (old. JCP). 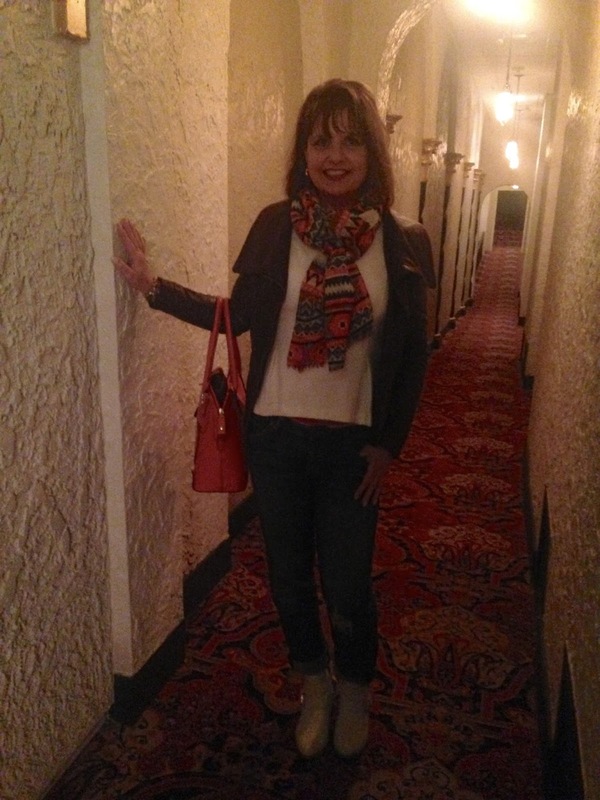 My purse is by London Fog, purchased at Stein Mart and it was a birthday gift from my daughter last fall. I played off the print and colors in my outfit, and wore a multi-strand, multi-colored bracelet on my wrist. My shoes are from Francesca's (old). These are one of my favorite pairs of booties that I own. But if you don't like to attract attention, these booties are not for you. Every time I wear them, people comment on them. All good things though! They are just very unique, so women notice them. I have worn them without socks many times, but this day I chose to wear socks for comfort reasons. I picked a white sock so they'd be a bit less noticeable and blend in with the shoe more. 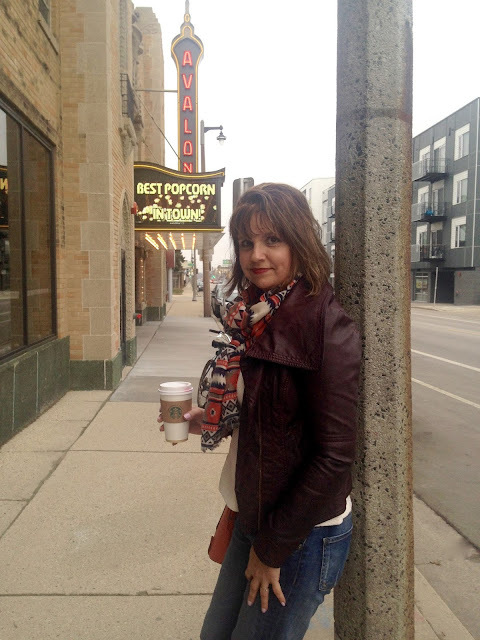 I wore a white peplum top from J.C. Penney under my jacket (Last scene HERE). My bottoms are Kut from the Kloth distressed boyfriend jeans from Stitch Fix. Finally, on a side note, if your a blogger 50 years of age and older, we'd love to invite you to participate in a blog series specifically designed for bloggers over fifty. It would be a great opportunity to meet bloggers in your own age group and also help promote your own blog. You can read more about it HERE. 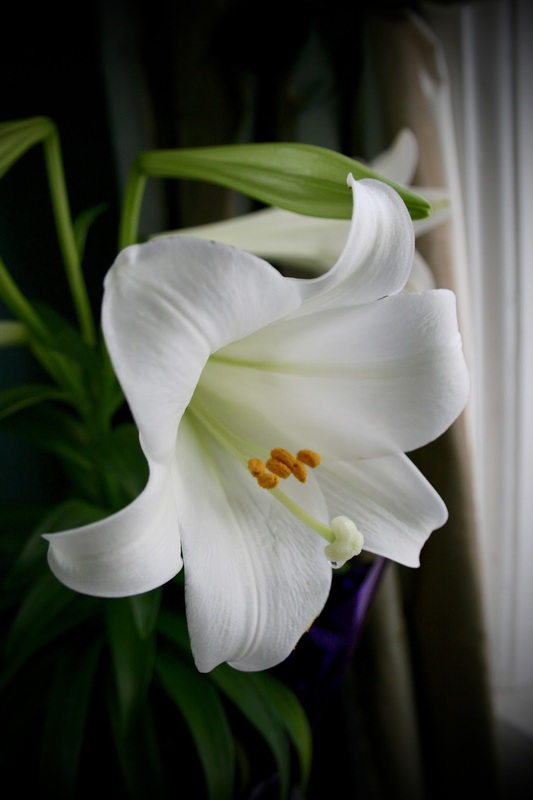 I am enjoying Easter weekend with my husband and friends and I hope you are all able to enjoy this blessed holiday with your loved ones as well. I will be back on Monday with a new fashion post, and on Wednesday I'll share our Easter weekend "Adventure" in my weekly travel post. Looking at these pictures, I can't believe this was my yard one week ago. Now it's buried in snow once again. We had a major blizzard move through our area last night and dump about ten inches of snow on us. UGH! The frustrations of spring. Hopefully it will melt soon. 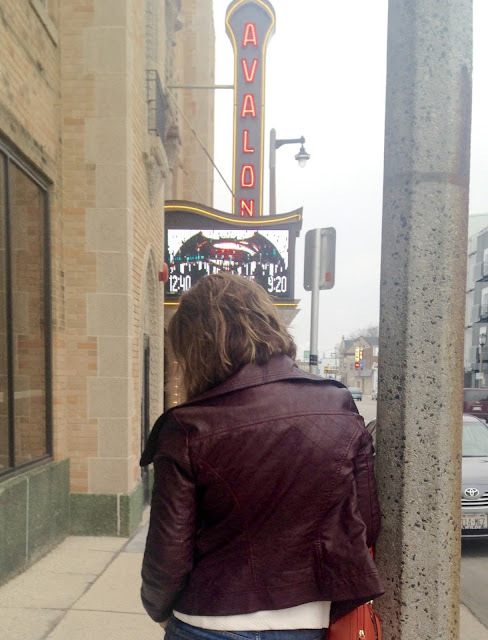 Today's post is all about spring (or fall) jackets. I have a plethora of jackets like the one I am wearing today: I have them in white, silver, black, brown plus the blush color I am wearing. I also own three different styles and colors of jean jackets, several pea coats in different colors, patterns, and lengths, and a trench coat. And I hardly wear any of them. Why? Because this type of jacket or any of the others, just aren't practical for my climate. It's either so cold you need a parka, or so warm you need nothing at all, with the exception of the three weeks of "Spring" or "Fall" we get a year. And I put those seasons in quotes, because in my opinion, we don't have those two seasons in Wisconsin. So why do I buy them if I can't wear them? Because I get such amazing deals on them! No one wears or buys these types of coats in Wisconsin, so when they go on clearance, you can get them for as little as $6.00....I'm not kidding! 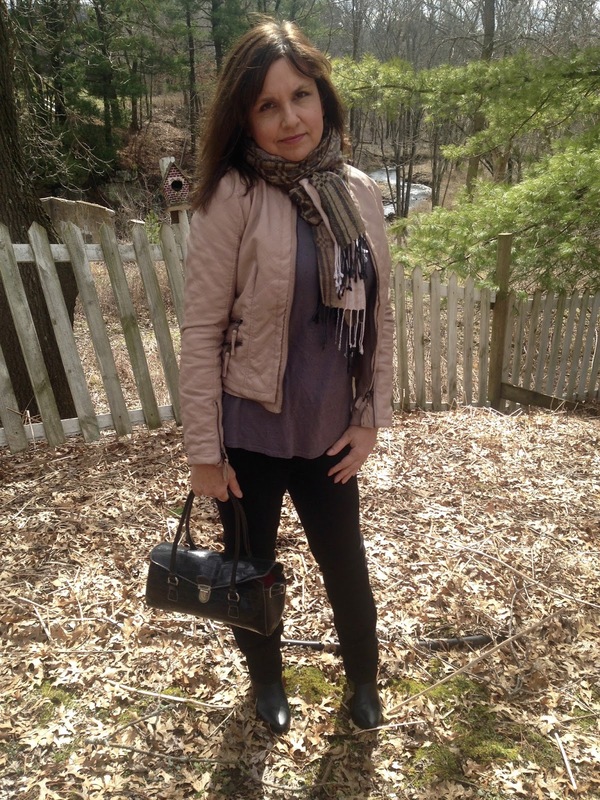 Even though I could have worn a winter coat this day as it was only in the upper thirties, I really wanted to get some wear out of my spring/fall jackets and chose to wear this outfit instead. I actually use a lot of my jackets as indoor blazers during the winter. And that was kind of the case this day since it was a shopping day. I was mostly running from the car to a building all day. I did get a little warm at times inside a store, and I was a bit chilly wearing only this outside. I chose to wear a scarf instead of a long pendant necklace, to help ward off the chill. Last time I styled the coat with eggplant skinny jeans, a tan shirt, and tall brown boots. This time I chose a grey long sleeve tee with black specks (previously shown HERE), black jeans, and black booties (all old and all from J.C. Penney). 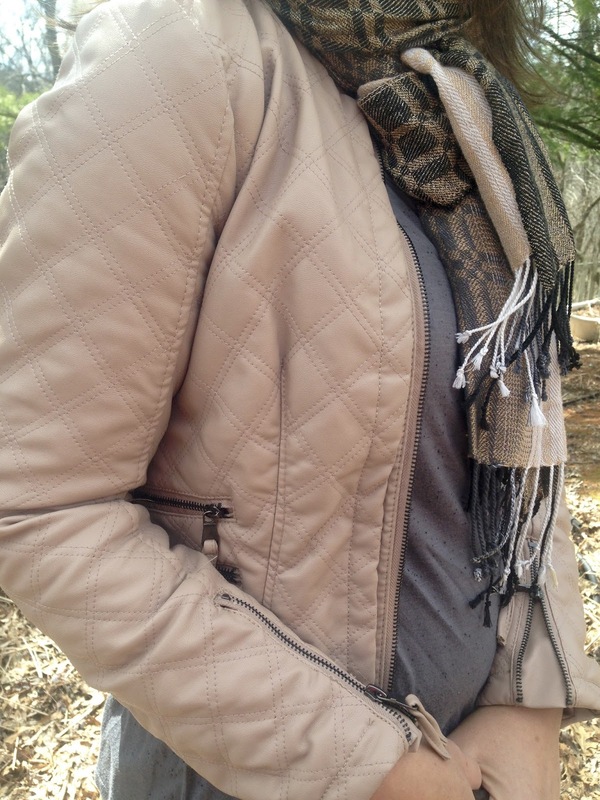 The jacket has a lovely quilted design, and I love the zippers on the sleeves. I wore a black camisole underneath my long sleeve t-shirt. That is the bulge you see that my husband/photographer didn't notice and tell me to smooth out. :) The t-shirt is a bit sheer, so a camisole is necessary for me. It is perfectly o.k., and in fact fashionable to let your shirt hang out in back when wearing these short jackets. It is such a simple outfit, yet appears quite fashionable with the addition of the scarf. I find that true of so many outfits. 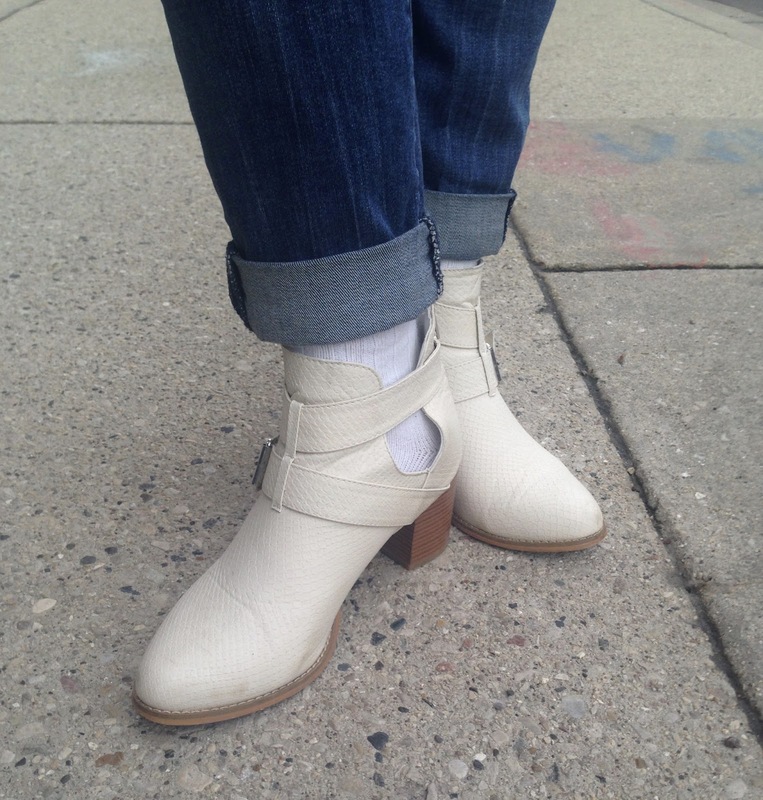 Many of us want to look well-styled, but we also want to be comfortable. If you focus on little accessories (like scarves, bags, jewelry, and cute shoes), you can dress up the simplest of outfits. I hope to cycle through the rest of my spring/fall coats before summer hits and wear all my jackets at least once. 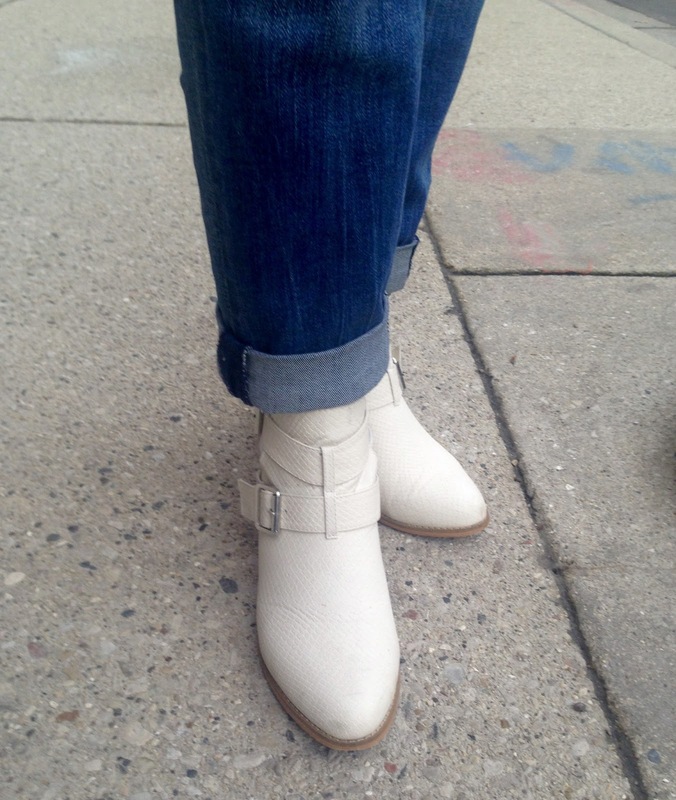 This Easter weekend, I plan on wearing my white leather jacket! Finally, on a side note, if your a blogger over fifty years of age we'd love to invite you to participate in a blog series specifically for bloggers over fifty. It would be a great opportunity to meet more bloggers in your age group, and also might help promote your blog. You can read more about it HERE.